Talgarth: Airfield details for visiting pilots and gliding experience passengers. 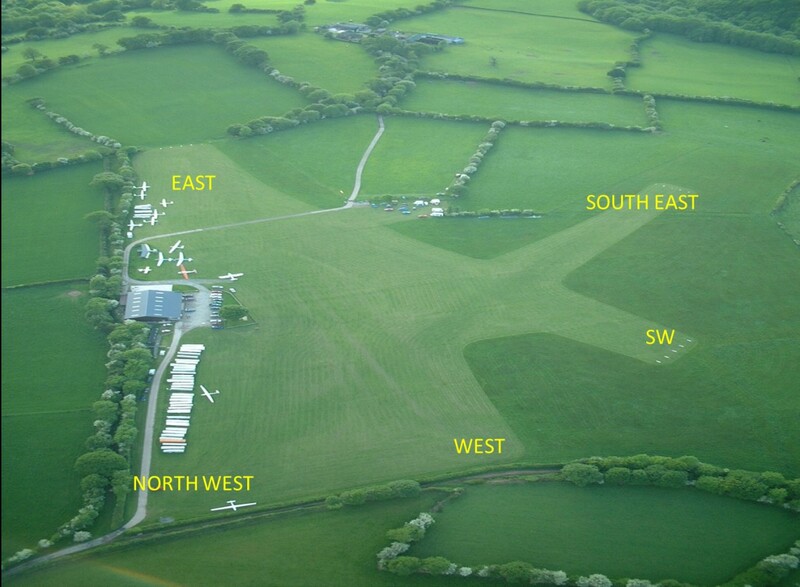 Our club and gliding school is a bit different to most other gliding sites in the UK. For a start, it’s nestled at 970ft AMSL in the western slopes of the Black Mountains and surrounded by farmland. It’s an idyllic place with fantastic views over the Wye and Usk Valleys, and into the Brecon Beacons. Our airfield is smaller than typical ‘flat land’ gliding airfield. But it still offers many take-off and landing options. There is a lot more room than first meets the eye. The field slopes away gently from its Southern edge in all directions, like an upturned saucer. This means there is a slight upslope for most landing directions. The size of the airfield puts some constraints on operations and also means pilots have to be disciplined in preparing to fly and helping to manage operations if everything is to go smoothly. You will enter the airfield via the gate at the South East corner of the airfield. The access road is obvious, with a tall hedge along one side and one of the glider trailer parks on the right. This leads to the club car park where you will find our workshop, clubhouse, hanger and general comfort facilities. Our camping area is located beyond the hanger. The airfield has a number of grass runways. These provide three take off and five landing options. These cover most wind directions.